I wanted to make salmon a little differently. I wanted a smooth sauce that was buttery and lemony. I wanted Hollandaise! But I had never made it. One reason is because it always seemed intimidating. Another is that most recipes make a large quantity of sauce, and there were only two of us so I didn’t want to make a lot. So I did a web search. Some of the recipes described as Hollandaise “for two” called for a whole stick of butter — no thank you! This recipe, which I found on a blog called The Spruce Eats, used only half that – which still seemed like a lot, but more reasonable. The title was “Hollandaise Sauce for Two,”but as you can see from the photo, where the salmon is just about swimming in the stuff, the recipe can easily serve four to six, because a little Hollandaise goes a long way! It was easy enough to make. If you’re looking for a rich, butter/lemony sauce, give this one a try! By the way, the black specks in the photo are the fresh-ground black pepper I put on the salmon before I cooked it. Put an inch or so of water into the bottom of a double boiler or a saucepan large enough to hold a metal bowl without it touching the bottom of the pot. The water should not reach the bottom of the double boiler insert or the metal bowl. Boil the water, then turn down the heat to maintain a low simmer. In the double boiler insert or bowl, whisk the egg yok, lemon juice, salt and pepper. Set the bowl over the boiling water and whisk slowly but consistently until the mixture starts to thicken. Add the butter, one piece at a time, whisking until each piece is incorporated before adding another piece. Repeat until all 8 pieces are incorporated. The sauce should be thick, smooth and glossy. Whisk in 1½ tsp. water. Adjust the seasoning and add a bit more lemon juice if desired. Remove the pan from the heat. The sauce will keep over the hot water for a half-hour or so as long as you whisk it occasionally. Pour over vegetables, fish, or poached eggs on toast. I bought a pot of basil at the beginning of the summer, separated the three little stalks in the pot and plonked them in my garden. As they grew, I cut off the growing tips so the plants would branch out. They became bushy and lush! But there’s only so much caprese salad* one can eat. And I already made and froze some pesto — I’ll give you that recipe later. So what do you do at the end of the season with all that basil? 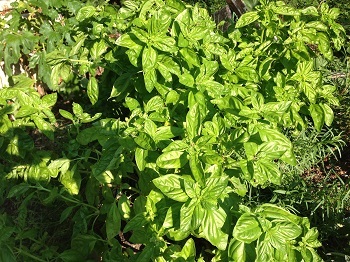 Here’s a tip that I got from my sister-in-law Rhonda that works for basil and just about any other fresh herb. We’ve done this very successfully with parsley and rosemary as well. Pick the nicest leaves — avoid any that are bug-eaten or discolored — and put them in a brown paper lunch bag. Don’t fill the bag more than half-full. Roll the top down to close it, but leave as much air space as possible in the bag. Put the bag in the bag of your refrigerator and forget about it — except once a week or so, take it out and give it a shake. 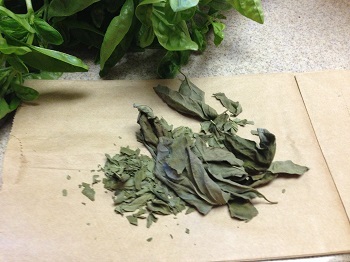 After about three weeks, the basil will have dried. (If it’s not completely dried, put the bag back in the fridge for another week.) Crumble it up on a piece of wax paper and store it in a plastic or glass spice jar. Meanwhile, here are a couple of ways you can use fresh basil. *For a caprese salad, slice a couple of large, ripe, red tomatoes and lay them out nicely on a plate. Slice some fresh mozzarella cheese and place over the tomatoes. Sprinkle with salt and freshly ground black pepper. Place several perfect fresh basil leaves on the top. Drizzle with olive oil and enjoy. Another thing I like to do with fresh basil is serve it with pasta. Boil up some spaghetti, toss it with a bit of olive oil after you drain it, then add some basil leaves cut into thin ribbons, fresh chopped tomatoes, a clove of chopped garlic and cubed or shredded mozzarella. Season with salt and pepper. I’m not providing quantities because you can really play it by ear . Tuesday Tip: I love my Misto! A couple of years ago, my kids gave me a great gift — I can’t remember whether it was for Mother’s Day or my birthday. It’s a Misto olive oil spritzer. You fill the container with olive oil, and then you just give it a spritz when you need a small amount of oil to grease a pan or to drizzle on top of a dish before roasting or serving it. You use a lot less oil than if you attempt to drizzle the oil out of your big olive oil bottle, and it costs a lot less than PAM and other no-stick sprays. I only have one, and I use it for olive oil. I still have a big can of Costco’s Kirkland brand no-stick spray that I use when I need a spritz of vegetable oil. But my daughter Miriam has a couple of Mistos, one for olive oil and one for canola oil, labeled in different colors so she can tell them apart. Smart! 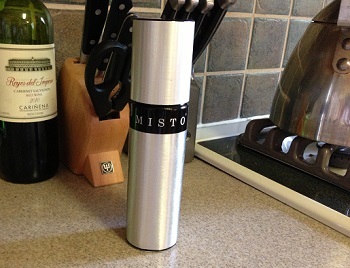 You can buy a Misto online at Amazon or at a lot of retailers, including Bed, Bath and Beyond, for about $10. You’ll easily save that much pretty quickly on the cost of olive oil . Here’s an example of where a Misto comes in handy — making pita chips! If you have some leftover or stale pita, cut it into pie-shaped wedges, and then separate the two halves of each wedge. Place on a baking pan as close together as possible. Spray all the pieces with olive oil from your Misto (or with non-stick spray if you aren’t lucky enough to own a Misto). Sprinkle the pita with garlic powder, onion salt, zaatar or some other seasoning, and bake in a hot oven (425 degrees) for just a few minutes until the pita starts to brown. Watch it carefully, because it doesn’t take long to go from brown to burnt! Remove from the oven and cool completely before storing in an air-tight container. Every family has one person who’s an ace at opening sticky jar lids. It isn’t me! When I was a kid, the go-to jar person was my younger sister, Sue. Everyone in the family, including Dad, would take a turn at a jar lid that wouldn’t budge, and finally we’d hand it to Sue, and pop! — off it would come. “You loosened it for me,” she would always say, modestly. I had a new jar of crushed ginger recently that I just couldn’t open. I tried using one of those flat rubber disks that companies and organizations plaster with their logos and give away as jar openers. No luck. I put a wide rubber band around the lid, which sometimes helps. It still wouldn’t budge, for me or for my husband. Finally I put another rubber band around the jar itself, and whaddya know, the lid finally popped. I don’t know if it’s because the rubber band makes the jar less slippery in your hands or if somehow it equalizes the pressure in the jar, but putting a wide rubber bank around the lid AND around the jar can often do the trick when all else fails. My microplane is one of my favorite kitchen gadgets! It enables me to very quickly get that “rind of half a lemon” — or orange — that many recipes call for. Before I bought it, I would use a regular box grater, which was less than satisfactory because the rind tended to be mushy, and half of it would get stuck in the grater, which was then very difficult to clean. If you’re like me, though, you often don’t have an orange or lemon on hand when the recipe calls for rind — or peel or zest, it’s all the same in recipes. I used to buy little jars of dried lemon peel and orange peel in the spice aisle of the supermarket. 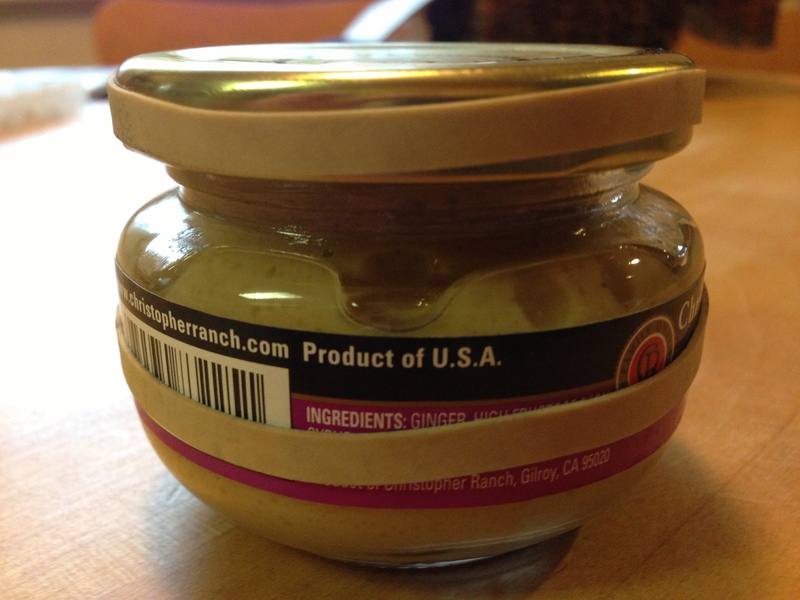 A jar containing 42 grams — less than 1.5 ounces — cost about $6. Then I realized how fast, easy and relatively inexpensive it was to make my own. I buy a few lemons when they’re on sale mainly for the peel. 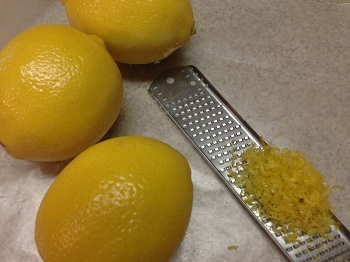 Use a microplane to take the zest off all the lemons and leave the zest on a piece of waxed paper overnight. The next day it’s dry enough to store — I keep it in the same bottle the overpriced store-bought lemon peel came in. (The zest from four good-sized lemons will fill half the jar.) It can last many months. Use it in the same quantities you would use fresh zest. As an added bonus, juice the lemons and use the juice instead of that stuff in the green bottle. My husband likes to drink hot water with lemon juice and says there’s a noticeable difference in the taste. In the summer, you can make fresh lemonade — yum! Make sure the lemons are at room temperature before you start. After you take off the zest, roll each lemon on a counter before you juice it; this releases more juice. My recipes don’t seem to call for grated orange rind as often as lemon, but when I start to run low, I just zest an orange, dry the zest and save it in my little bottle. Then I just eat the orange or use it in a salad. By the way, an average lemon will yield 2 to 3 tablespoons of juice and 2 to 3 teaspoons of zest.